1. 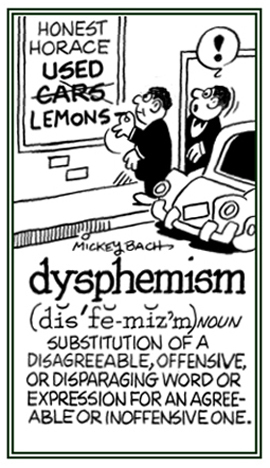 An offensive expression or word that is deliberately substituted for a neutral one: Ted's brother used a dysphemism when he was talking about visiting a friend who was in a "loony bin" instead of saying in the "mental hospital". 2. Any physical impairment or problem when speaking: Jan was so chilly from being in the winter storm that she could only explain what happened with dysphemisms of stutters. © ALL rights are reserved. Any condition due to a disorder of the pituitary body. 1. The production of gas bubbles in body fluids, arising from the sudden reduction in ambient pressure which may occur in decompression sickness and is a hazard for astronauts on the moon, where there is no atmosphere. 2. The formation of bubbles in body fluids under sharply reduced environmental pressure. 3. Formation of water vapor bubbles in the tissues brought on by an extreme reduction in barometric pressure. It occurs if the body is exposed to pressures which are found above an altitude of 63,000 feet, or if a diver rises rapidly from a great depth in a water environment to the surface. 1. Excessive adherence to ecclesiastical forms and activities. 2. Religion appropriate to a church and to ecclesiastical principles and practices. 3. Ecclesiastical principles, practices, or spirit. 4. Devotion; especially, excessive devotion or adherence to the principles, forms, or interests of a church. 1. Making decisions on the basis of what seems best instead of following some single doctrine or style. 2. A tendency in architecture and the decorative arts to mix various historical styles with modern elements with the aim of combining the virtues of many styles. The view or belief that environmental concerns should take precedence over the needs and rights of human beings considered in isolation. A socio-political theory and movement that associates ecological (especially, environmental) concerns with feminist ones; especially, while regarding both as resulting from male dominance and exploitation. 1. The threat to use violent acts that would harm the quality of the environment in order to blackmail a group or society: "Ecoterrorism also includes the actual carrying out of the threats." 2. The sabotage of the activities of individuals or corporations; such as, industrial companies, considered to be polluting or destroying the natural environment. A form of tourism that strives to minimize ecological or other damage to areas visited for their natural or cultural interest. The congenital (birth) absence of part or all of one or more fingers or toes. 1. Regarding oneself and one's own opinions or interests as most important. 2. An attempt to get personal recognition for oneself; especially by unacceptable means. Showing page 18 out of 63 pages of 943 main-word entries or main-word-entry groups.